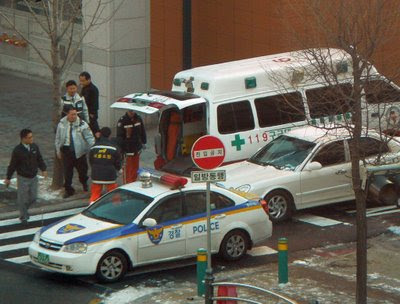 I was looking out my apartment window recently on another freezing cold day and saw this scene of someone being loaded into an ambulance across the street. The individual on the stretcher appeared not to be seriously hurt. I hope they make a speedy recovery. 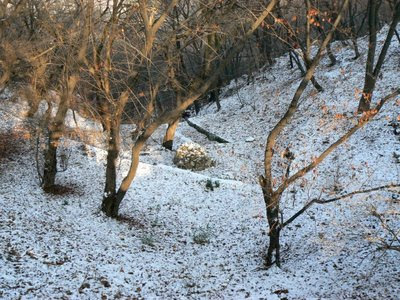 As we have not had much snow in Seoul this year, I am keen to show us much of the little we have had. This shot was taken on Namsan. 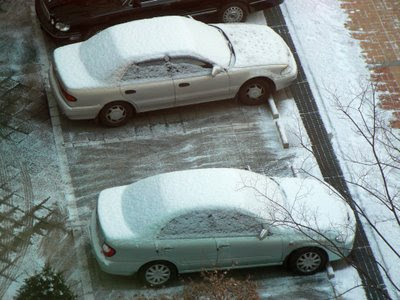 A recent view from my apartment window after a light snow fall. 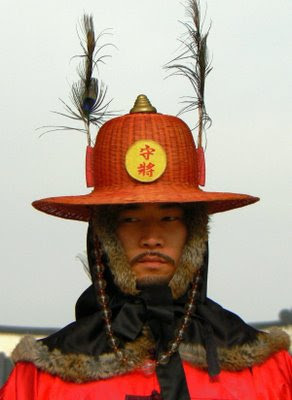 A guard on duty at the front of the Gyeongbok Palace. 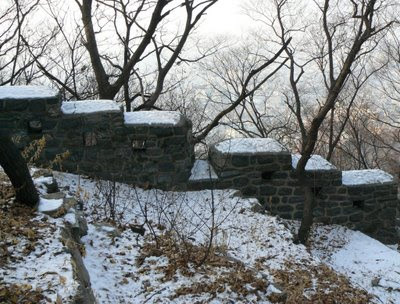 The remains of a recent snow fall on top of Namsan. 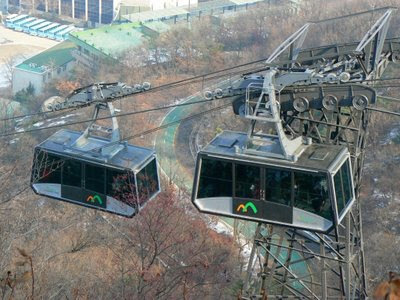 New cable cars travel up and down the side of Namsan. Merry Christmas to all the viewers of this blog! 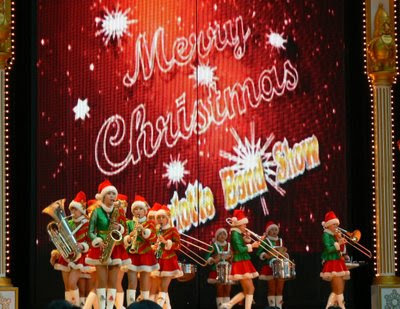 The photo today shows the all girl brass band performing on-stage as part of the Christmas show at the Lotte World Amusement Park. The photo today was taken by my 15 year old son who is currently staying with me in Seoul. 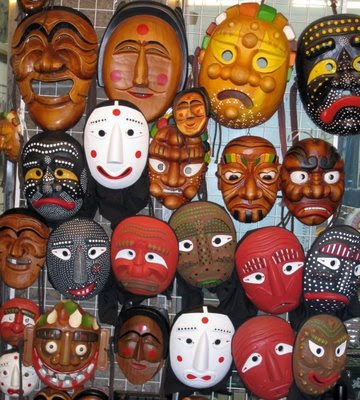 It was taken in Insadong and shows the masks on display outside a vendor's store. I rarely use black and white but thought that it might add more of a dramatic effect to the subject for today. 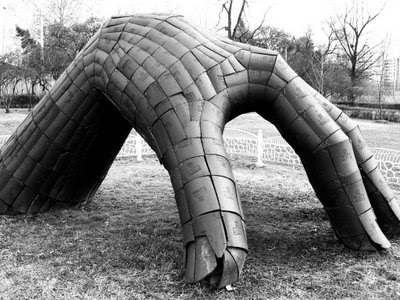 This sculpture of a hand is made from a series of roof-like tiles wired together. The sculpture stands as tall as a man and can be found in Yongsan Family Park. 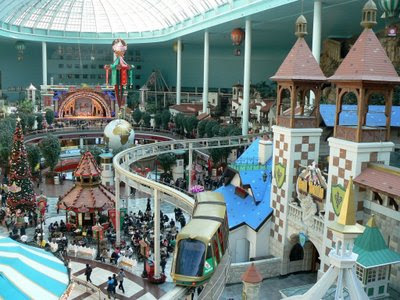 A view of the indoor section of the Lotte World amusement park at Jamsil. 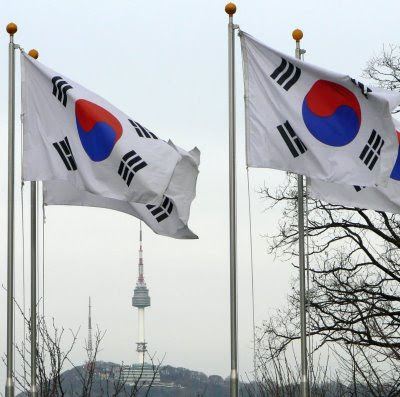 Korean flags flying with N Seoul Tower in the background. 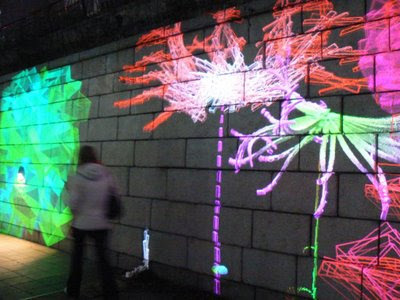 Chungdaechun, the Digital Stream, features "Digital Garden" a work by the Mexican artist Miguel Chevalier that involves the projection of laser-generated images along the walls of the Cheonggyecheon. 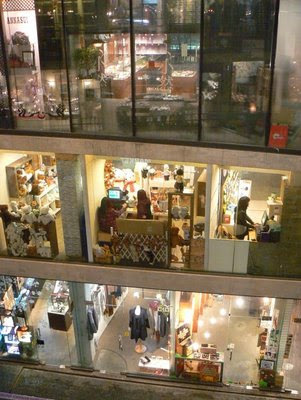 A dolls house view of a multi-level shopping centre in Insadong. 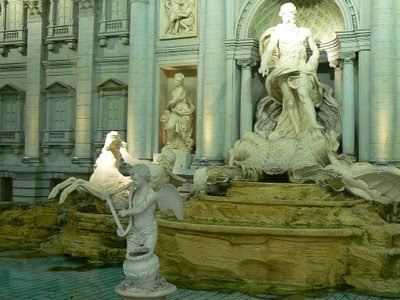 A replica of the Trevi Fountaion outside the Lotte department store an Jamsil. 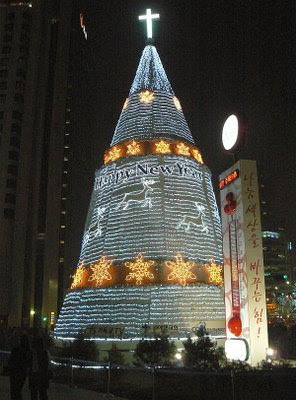 The large illuminated Christmas tree in front of City Hall. 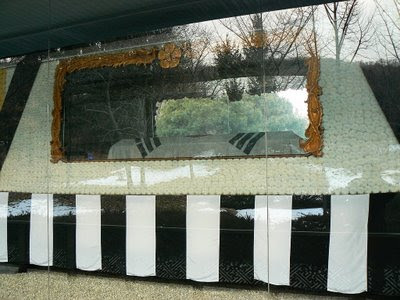 This photo was taken in the National Cemetery of Korea and shows the burial caisson of President Park Chung Hee. President Park was assassinated on 26 October 1979. 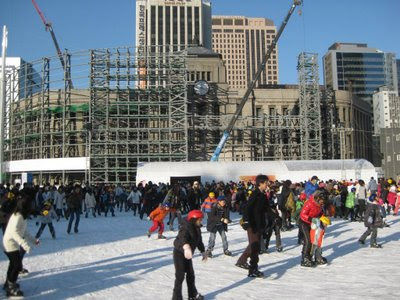 Each year the plaza in front of City Hall is turned into an ice-skating rink. Admission is only 1,000 Won, which I'm told includes the hire of a helmet and skates. When I came past the rink yesterday there was a long line of people waiting to buy tickets and to get fitted out with gear. I had to go into work yesterday to catch-up before going on holidays in the middle of next week. I was so busy that I completely forgot to make a post. So here is what should have gone up yesterday. 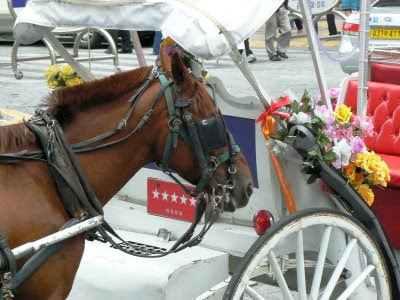 The photo shows one of the horses that pulls open carriages around Downtown near the Cheonggye stream. 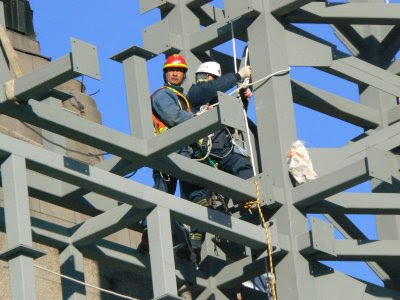 Workers on a heavy-duty scaffold at the front the Seoul City Hall. I'm not sure what's planned during the redevelopment project, but let's hope it doesn't go the way that the rear of the historic building did (click here)! 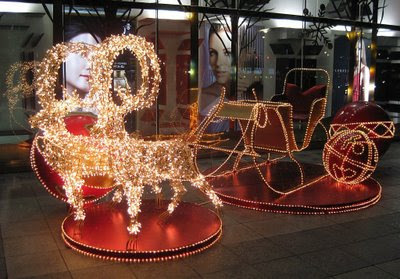 Another set of Christmas lights, this time on a sleigh outside the I'Park store in Yongsan. 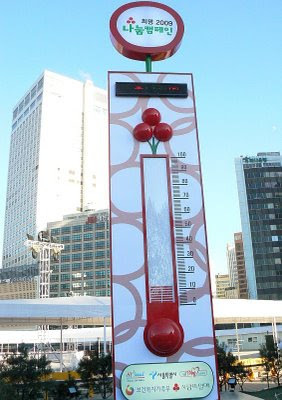 The Love Thermometer is set up in front of City Hall to monitor donations from the public. The target amount is represented by the 100 degrees mark and each degree equals one percent of the target amount. I took this photo on Saturday when the "temperature" was at 11 degrees. I will revisit the site again before the year is out to see if it "boils"
This was the scene from my apartment window on Sunday morning. 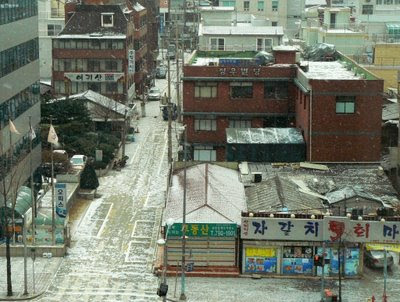 It was the second snowfall that I've seen in Seoul so far this year and a light one at that. It also snowed again briefly the same evening but it all melted pretty much as quickly as it had arrived. It really doesn't seem as cold as it was this time last year. Anyway, I am having family from Australia come to stay next week and I am really hoping that the snow kicks in so that we can all have our first "White Christmas" together. 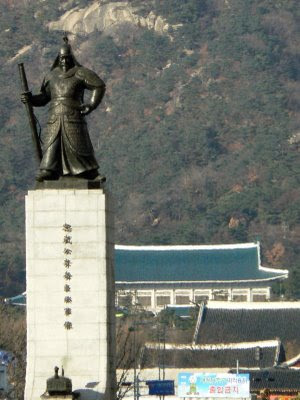 The recently restored statue of Admiral Yi Sun-Shin in central Seoul with Cheong Wa Dae, otherwise known as the Blue House, or the Office of the President of the Republic of Korea, in the background. 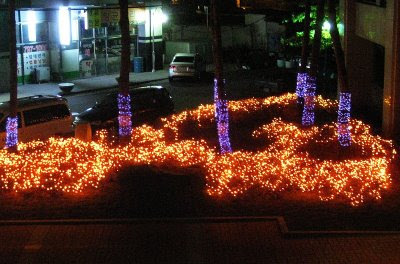 An early morning shot of the Christmas lights that my apartment management office has placed in the gardens near the entrance to the complex. The last of my mini Suwon-series this week. 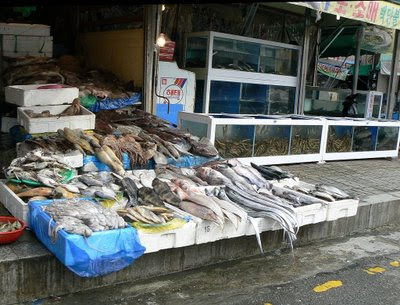 I saw this fishmonger's stall as I was leaving the Hwaseong Fortress and heading back to Suwon station to make the train trip home to Yongsan. I am forever fascinated by the range of weird and wonderful sea creatures that are on sale at such places. 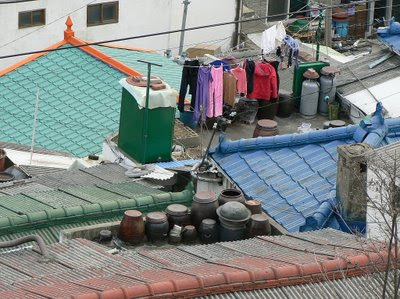 A view across the coloured rooftops of suburban Suwon. 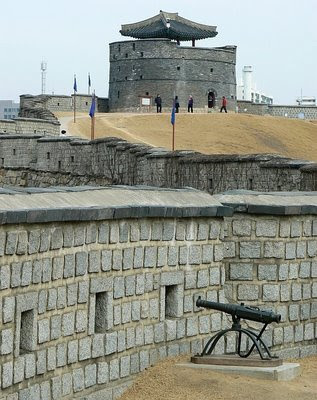 A view of part of the Hwaseong Fortress wall at Suwon. In the foreground there is a small gun called a bullanggi (click here to see the plaque near the gun). Suwon is a provincial city south of Seoul but can be reached on the suburban rail network. 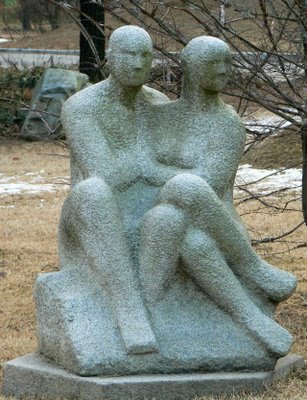 A sculpture in the gardens of the National Cemetery of Korea. 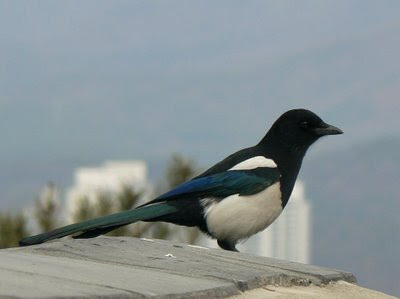 A Korean magpie. I saw one of these beautiful birds sitting on the window sill of a colleague at work this afternoon. Although I wasn't quick enough to get a photo, I offer up this one that was taken a little while back. The theme this month is spheres/circles and there are more than 185 blogs participating. 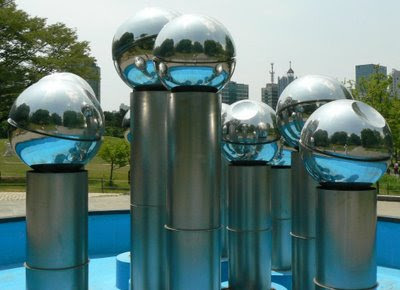 These particular spheres form part of a water feature in the grounds of Seoul Olympic Park. I like this photo as there are reflections of the spheres within the spheres (as well as the reflection of your City Photoblogger, if you look very closely). You will also see circular depressions in some of the spheres, which is a bonus for this Theme Day. Click here to view thumbnails for all participants.